Around 9:00 we left the house on our way to Lucerne. Gregg and Ross told us about the amazing market they had there so we went to check it out. Kathy says: "Oh my god! 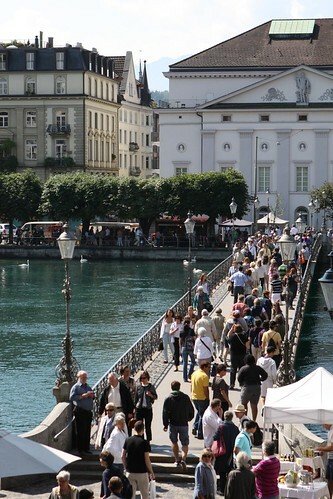 Lucerne? Seriously? You guys never met a tourist trap you didn't love did you? First Interlaken and now this? You guys are so lame!" It was very busy. Many of the vendors there spoke enough English so that we could get by. One guy, when Jen asked him if he spoke English, responsded, "Yyyyyyyup." Then he upsold us on some cheeses. He's one of the top five Swiss people we've met so far. 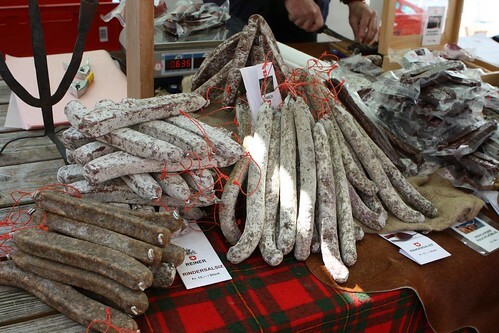 Another vendor asked me, in German, if I'd like to try some cured meat. I politely said, "No thanks." Then he muttered something about wanting me to die -- again in German -- under his breath. I don't need to know German to know exactly what he was saying. I may count this as getting yelled at today. Or at least as attracting a complete stranger's utter disdain. 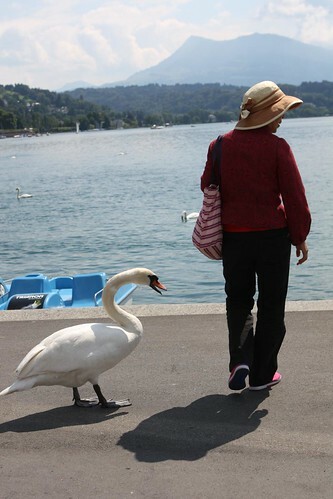 Out by the lake there were many Höckerschwan out and about. Here's one in action at the exact instant that it was about to hiss and bite a tourist in the leg. This is my Eddie Adams shot of the incident. 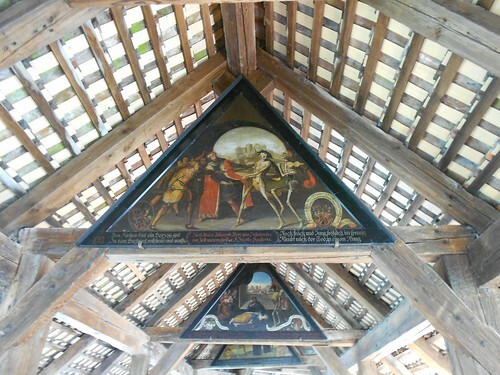 On the bridges that lead tot he market the tops are lined with terrifying paintings of skeletons attacking people and attempting to take over the Earth. Presumably this was done for no other purpose than to haunt Swiss children's dreams for the rest of their lives. After a stop off at home we crossed the chrummbäch (seen above) which translates as "crooked brook." 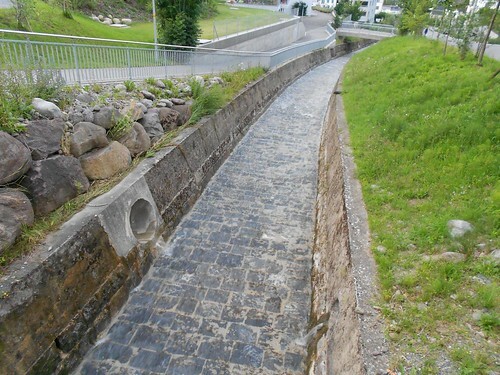 As you can see this looks neither like a brook nor crooked but rather like a Roman aqueduct. At any rate it was extremely nice. I wish we had a chrummbäch back home but instead we have a brook that has stagnant water and flies. Once on the other side we joined some friends for an amazing barbecue with ribs, lamb, more veal wurst, salads, chips, nuts, and all manner of beverages. The celebration was for Curaçaoan flag day. We also had a fantastic assortment of Curaçaoan desserts including a wonderful prune cake and what appeared to be profiteroles filled with a thin pastry cream and tossed in chocolate which might have been the greatest dessert moment of my life. 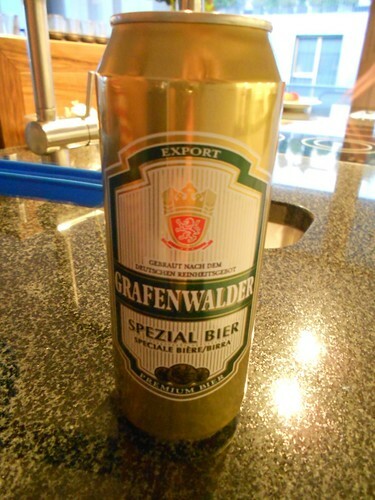 I also had yet another Swiss lager, this Grafenwalder Spezial Bier which was lovely on a sunny evening in Switzerland. 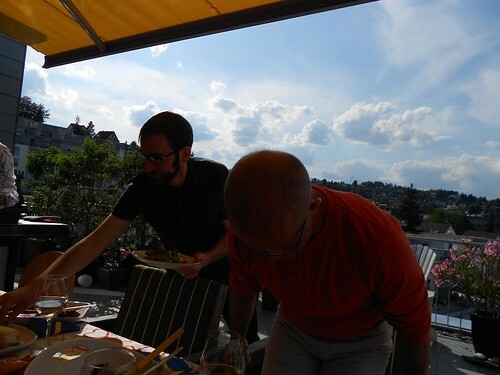 Of course, a dagger in the neck may be nice on a sunny evening in Switzerland. 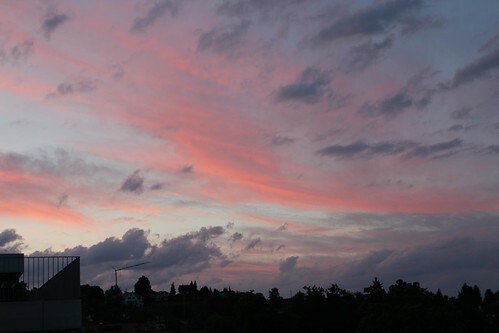 But, alas, our final day in Switzerland draws to a close. Tomorrow we set back out to Zurich to pick our car and start the drive to France. What wonders will await us along the way? What perils will prevent us from reaching our destination? Will the Swiss authorities detain us when they discover we're trying to smuggle six apricots into France? You'll have to check back tomorrow to find out! Kathy says: "Oh, good! I can't wait until you find out I'm the sales manager at the Zurich airport Europcar! See you tomorrow morning, fools!"